Do you remember your first science fair project? All that research in the library, carefully printing your experimental procedure, plotting your results, and the nail-biting presentation for the judges — it’s all coming back, isn’t it? Well, thousands of students are going through that same thing right now in preparation for the 2009 District of Columbia Mathematics, Science & Technology (DC MST) Fair on Saturday, March 14 at the McKinley Technology High School from 8:30 until noon. One piece of this is still needed, and that’s judges. For the senior projects that means very knowledgeable folks; trust me, these kids are sharp! For the junior projects, more a more general background is needed. And really, it’s not all robots! Expertise is needed in animal sciences, behavioral and social sciences, biochemistry, cellular and molecular biology, chemistry, computer science. earth and planetary science, engineering, environmental sciences, mathematical sciences, medicine and health sciences, microbiology, physics and astronomy, and plant sciences. The two top winners here will go on to compete with students from all over the world at the Intel International Science and Engineering Fair. To be honest, the DC fair has been pretty dismal in the past, owing primarily to a lack of staff support. I’ve judged science fairs across the region for several years and I can tell you that the DC fair has come a long way. It was still worth going to even when you were lucky to get a printed list of projects, let alone the catered breakfast and lunch, packet and clipboard, and staff support that’s provided today (by the very generous and competent Walter Reed Army Institute of Research). The reason it’s worth it is simple: the kids. These are the ones who have the drive to make a career in science and technology and a difference in the world. Many have had little or no exposure to the S&T community, so the 5 or 10 minutes you spend with them is priceless. The deadline to register in DC is March 2, 2009. See you there? Prince George’s Area Science Fair at the Howard B. Owens Science Center at the PG Community College, Saturday, March 28th, 7:45AM until 1:00PM. Taken, on Iphone, between Crystal City and the Airport. Yellow Line to Huntington, Doors Closing. I hope you’ll forgive the Moulin Rouge inspired title, but it fits. Most workday mornings involve me getting on Metro at the Crystal City stop and “reverse commuting” to Old Town. This ensures not only an empty seat, but usually enough room to lay down and play scrabble against someone else on the floor. Not that I would. This morning? The height of travel frenzy (at almost 10am by the way!) as those using the Ronald Reagan/Washington National Airport were making their way (bags and all) to stand in line to get on a plane and fly home. All of this by way of saying-safe travels and happy holidays from me (and probably all of the DC Metblog crew). If you, like me, are a resident of the City of Alexandria City, you may have noticed a terse letter from Mayor Euille in the Alexandria news bulletin that arrived in your mailbox last week. The Norfolk Southern Railroad has established an ethanol transloading facility at its yard in the West End neighborhood. Now, apparently they own the facility and have gotten the National Surface Transportation Board to override at least some local ordinances. The City Manager and City Attorney have admitted that communication (internal and external) was badly handled and the City Council has opened up their records and documents for public inspection. In short, the City folks are displeased about this facility! It is apparently located thisclose to an elementary school, and is also near the Beltway and the Blue line. NSRR has bought some fire equipment for the City, including providing a quantity of the special foam that would be needed in the event of a fire, and conducted some training for Alexandria FD. They’ve also agreed to certain time restrictions on the number of trucks coming and going from the facility. I’m not sure what to think, myself. I wonder how much of this issue stems from NIMBY-ism? Did the railroad really just unilaterally plop an ethanol facility 600 feet from an elementary school and think no one would notice? How real is the security concern? (IMO, not very, but then I am quite jaded about “security” these days.) How real is the risk of fire or explosion? We have all seen enough news reports of chemical factory or fuel dump explosions – with horrific effects – to worry about it, even though the probability may be incredibly low. In any event — Alexandria has put together a website where you can read documents and correspondence, or look at a map of the facility and its neighborhood. What’s your opinion — should we be concerned? A scant six months ago, I joined the wild and crazy crew here on MBDC; I was branching out in my blogscapades and wanted to try my hand at writing about the area that I’ve come to love. Everyone here has been extremely good to me, one of the new kids on the block. The experience has been inspiring and has driven my creativity in approaching this area to new heights. I’ve been driven to explore this town more than I ever have before, in search of new restaurants, new venues, and new entertainment. Much of these experiences I’ve yet to share; sadly, I won’t be doing so on this stage. Instead, I’m leaving MBDC and moving to We Love DC. My continued excitment over living here remains unabated. With our imminent purchase of a home in northern VA, I look forward to planting our roots deep into the soil and growing old with the District – inside the zone and through the Beltway. And sharing all of this with the great people of the area with more passion and freedom than before. So thank you, readers, writers, commentors and the MBDC staff for taking a chance on and accepting the missives from one of the small fish in this vast pond. May your futures remain bright and your cameras nearby. I was assured the matter was being looked into and the franchisee was being notified. Supposedly I should have already received a call from the store (nope) and received a gift certificate notification through the mail (nope). So last night me and the missus went to look at a couple of townhomes, one of which we’re considering purchasing. We’d both had a really long mental day at our dayjobs, so I suggested we make the trip out to the Cold Stone Creamery on US 1, near the I-495 interchange. There’s not really a good place for ice cream near our current home and we both like the taste of CSC’s ice cream. So it’s worth the drive for us. My lovely wife and I went to Taverna Cretekou in Alexandria recently. The food was fabulous, as was the service. The highlight of our visit came after the meal, when the waiter read Elise’s fortune in her coffee grounds. Was it simply a ploy for a bigger tip? Probably, and likely it worked. I highly recommend this restaurant. Fabulous food, great service and reasonable prices for an upscale place. We broke for lunch late, and headed over to The Overwood in Alexandria. I do their website in exchange for the occasional free lunch, and I hadn’t seen them in a while. So we went over and sat at the bar for a late lunch. Rami, the chef, came out and said hey, and took our order. He also asked how we liked grits, and wanted to know if he could try something out on us. Generally, when chefs experiment, it’s best to be there. They start thinking outside the box, and then they deliver big. Rami brought out this delight, which my camera fails to adequately capture. 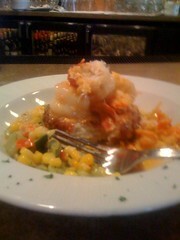 It’s a grits cake, in lobster sauce with veggies, crawfish and shrimp. And it was heaven on earth. The grits were perfectly textured and subtly flavored, the lobster sauce creamy, and the crawfish and shrimp moist and perfectly done. Sometimes it’s good to know the chef. I understand this is on the menu all weekend, DC-folks.